https://www.tradebit.com - Royalty Free license agreement. https://www.tradebit.com grants you the purchaser of our recorded works the non-transferable right to synchronise the https://www.tradebit.com products (Sound Effect/s) into your production under the following license agreement. https://www.tradebit.com are the sole copyright owners of the https://www.tradebit.com sound effects library and DO NOT belong to any royalty collection agencies so you will not be expected to pay any additional fees for our products. You may use our sound effects in any production whether it is for commercial or non-commercial use. There is no limit on the number of copies that can be made of your production. 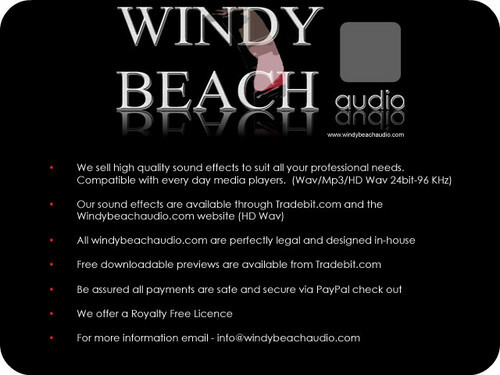 You may use the sound effects you have purchased/downloaded in as many different productions as you like without paying any further fees. You can make unlimited copies of your production that includes our sound effects. The https://www.tradebit.com license covers you for both broadcast and theatrical usage. You can edit, re-arrange and add effects (e.g. reverb) to the https://www.tradebit.com products in any way you wish; to suit your production. You cannot re-sell the https://www.tradebit.com product in its raw form or include any of the https://www.tradebit.com products as part of an external sound effects library without the owners permission. The sound effect/s must be incorporated into a production of some kind i.e. There must be a bespoke scripted voice over or synced with a visual element where the main focus is on the production. You cannot claim any intellectual rights to our sound effects even if you rearrange, edit or add effects to the product. We remain the sole copyright owners of the https://www.tradebit.com sound effect library. We would appreciate a credit when you use our product. If you are required to file a cue sheet then please use the following information. Remember we are not registered with any PRO but filling out a cue sheet is often necessary. Principles Of Healing Through Movement: An Alternative Holistic Approach To Therapeutic Movement For Those With Cancer And/or Chronic Illness - , Henry Thomas Jr.